- 10 % discount until 31 Oct 2017 (not valid for New Year Period 26 Dec 2017 - 03 Jan 2018)! 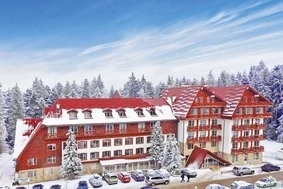 Location: Iglika Palace Hotel is located in the centre of Borovets mountain resort, just 150 m away from the ski lift. The hotel offers warm and hospitable atmosphere and comfortable accommodation. Accomodation: Iglika Palace Hotel offers 120 standard rooms, luxurious rooms and suites. All rooms feature cable TV, telephone, mini bar, en-suite bathroom (with bath or shower). There are 8 family villas for rent, located near the hotel – an ideal choice for a family vacation. Each villa features a kitchenette, a living area, two double rooms, an en-suite bathroom. Wine & Dine: The hotel offers a spacious restaurant with 150 seats. Guests of the hotel can enjoy Bulgarian and European cuisine and unforgettable evenings by the fireplace in the restaurant. The cosy lobby is the perfect place to meet friends over a cup of coffee or tea, drink or cocktail. The lobby offers free Internet access. Hotel Facilities: The hotel offers telephone, information and money exchange, restaurant, bar, secure parking, ski rental, ski school, medical centre. Guests of the hotel can also enjoy an indoor swimming pool, modern fitness centre, sauna, solarium and relaxing massages.